Padilla Cigars introduced their new line of Reserva cigars at last year’s IPCPR trade show. The line features three differently wrapped cigars: Criollo 98, Corojo 99, and the San Andres maduro that I am reviewing today. As is with the other wrappers, the San Andres comes in Robusto 5 x 54, Toro 6 x 52, and Double Toro 6 x 60, with prices running from $6 to $7. The lower price range was the impetus for Ernesto Padilla in creating the line to prove that a high quality boutique cigar could be made to give the consumer a more easily affordable smoke by cutting corners in packaging and marketing without compromising the quality of the tobaccos used. Information on these blends is a little difficult to come by, especially since the Padilla website is “under construction” (a pet peeve of mine – c’mon, just get it up, lol!). Fortunately, I was able to glean some info from Brian Hewitt’s coverage of IPCPR over at Stogie Review. As usual, I picked up a few of the Toro from the good folks at Cuenca Cigars. 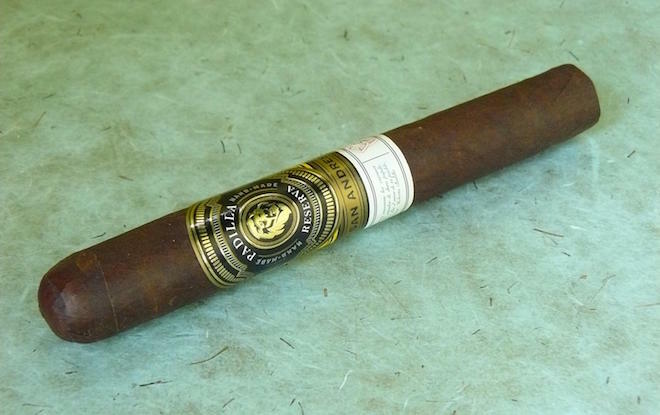 The Padilla Reserva San Andres is a great looking cigar, draped in an extremely dark chocolate brown leaf with even darker splotches, an oily feel, and smallish veins which appear to have been rolled flat. The roll is rock solid with no soft spots and the nearly invisible seams lead to a nice triple cap. The banding is impressive and although it appears to be double-banded, it is actually one piece. The scent given off by the wrapper is a surprisingly light earthy barnyard, while the foot displays deep, rich tobacco with some grassiness and a hint of cocoa. The cap cuts easily, exposing a cold draw of sweet spice and hay, while leaving a slight tingle on my lips. The Padilla Reserva San Andres starts off with a peppery bite on the first few draws along with deep earthy tobacco and smoky wood. The pepper quickly fades on the entry, but remains on the retrohale. A nice sweet and tart citric note comes in to mingle with the deeper medium-full elements. The burn line has started out thick and somewhat uneven, leaving behind a solid looking ash. Leather and a bit of coffee enter the picture as the body of the cigar takes a step back toward medium with a very smooth mouthfeel. By the 1 ½” point, the pepper bite has almost completely dropped off and the coincidentally, so does the ash. Sweet spices play on the tip of the tongue, while some breadiness emerges on the back end of the retrohale, and the burn has completely evened itself out. Moving into the center portion, the Padilla Reserva San Andres is exhibiting a berry-like fruitiness and cocoa to complement the dark wood and leather, while it retains an intriguing smokiness. The body has begun to climb back up, but I’m feeling little, if any, nicotine strength at the halfway point, and the smoke remains very smooth. The fruit has faded away to be replaced with a note of meatiness. The Padilla San Andres moves into its final third with the shift upwards in both strength and body. The draw has tightened up a bit, causing me to have to take double and triple puffs, but carefully rolling between the thumb and fingers alleviates some of that. Much of the sweetness has gone away, however, and the cigar is now much more savory, although the citric tang remains. Some char has shown up and pepper has re-entered. With the flavors getting somewhat muddied, I put the cigar down with 1 ½” left, finishing medium-full in body and medium-plus in strength. It has smoked cool and with just a bit of softness down to this point. I do wish that the Padilla Reserva San Andres has retained those flavors that had me really enjoying it in the first two sections, but as I recall, the first one I smoked was great all the way through. Its construction is top-notch and the price makes it a great value for those looking for an affordable stick that boasts flavors that complement each other well and hangs out on the higher end of the scale in terms of body. 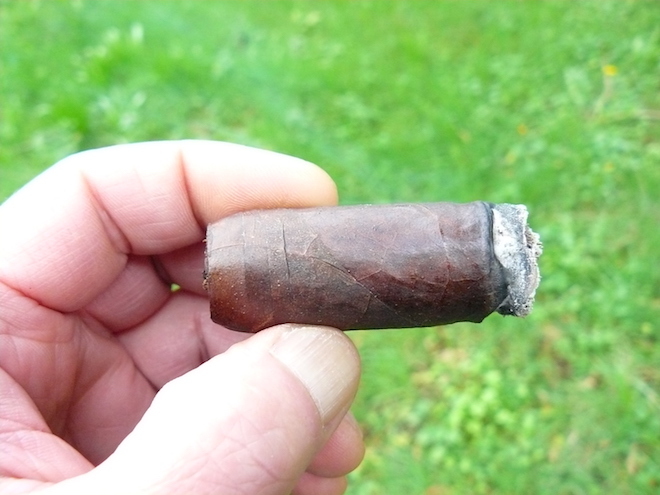 Although the cigar fell a little flat for me at the end, I think that this was somewhat of an anomaly, so I would definitely consider it one well worth picking up on to try out. I will certainly be smoking it again. The Dark Star Imperial Oatmeal Stout is another seasonal from Seattle’s Fremont Brewing. Showing a nice medium mouthfeel and flavors of roasted coffee, caramel, and sweet malt, it finishes with a great balancing light bitterness and a bit of tanginess, making it a great match for just about any dark cigar. The Padilla Reserva San Andres should also pair well with a sweet porter, a tawny port, or a strong cup of coffee.